No marketing plan, event schedule, blog – indeed, pretty much any form or marketing more advanced than a sandwich board – has a social media (SoMe) angle. However, experience has taught me that saying ‘we’re doing social media’ and actually doing social media are two different things. So why was Micro Focus Universe 2019 such a SoMe hit? A few things spring to mind. Firstly, establishing a tangible ‘social media station’ created a base to engage those within the four walls of the AC Vienna Conference Centre, and, more importantly, expanded our reach to all 13,000 Micro Focus employees and an additional 26,987 people beyond. Seems obvious, but not the key learning for me. As a marketer, I know that stretched marketing budgets and headcount often means turning to third party vendors to execute social media plans. Nothing inherently wrong in that. Micro Focus uses them many times and we consider them part of our extended family. However, the importance of having a strong – doesn’t need to be large – dedicated internal social media team can’t be overstated. Professionals who curate the SoMe narrative, control timings, QA content, and ensure consistency. Because successful social media is a team effort. 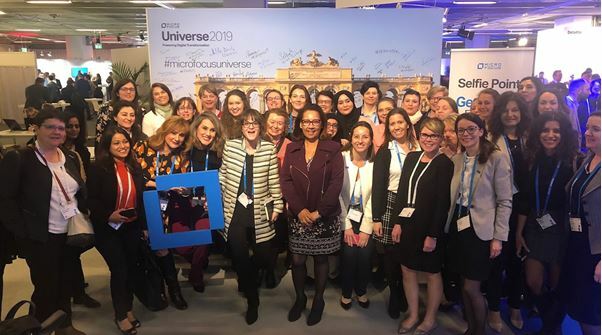 We used Micro Focus Universe 2019 as a catalyst to involve the broader marketing team to support our SoMe efforts. A smart way to scale that helped our teams feel more connected to what was happening with our customers and partners. Some of the extended team joined us onsite in Vienna and for those three days their almost sole focus was social media. And focus is the key. Social Media done well takes knowledge, experience and focus. It can’t just be an afterthought, an add-on to someone else’s task list. It must be the main job of a few, supported by the many (without wishing to be distracted, I compare it to the use of cloud vs. on premises infrastructure in the context of performance testing). How did we do? The proof is in the results. Our small but dedicated team achieved more than 27M impressions across two days. We wouldn’t have achieved that without focus and dedication from a dedicated band of in-house specialists. Similar results from a third party advertising supplier would likely have cost us in excess of $1M. As I said at the beginning of my first blog, life moves pretty fast during event season, and in the true spirit of B2B Enterprise Marketing, we are already onto our next series of major customer events. You can find them all here. Wherever we go, and whatever we say, we’ll be keeping it social – and growing our own!